Josh had a wonderful Christmas and New Year! When I asked him what was going to be the best thing about Christmas… he said “being with my family”. Just Perfect! 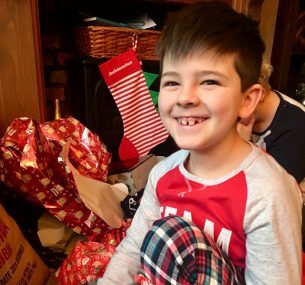 He loved all his gifts from Father Christmas and enjoyed lots of lazy PJ time. Welcoming in New Year was very special as this is the year he will of been in remission for five years! Definitely a reason to celebrate. Jane, Josh’s mum, December 2018. 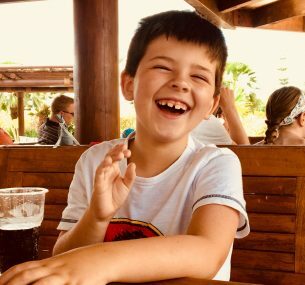 Josh is now officially four years in remission and is doing brilliantly. We have his next appointment in May 2019 for a check-up and an echocardiogram on his heart to check that there is no damage from the chemotherapy. If all is okay, he will then be discharged. Josh has finished Year 2 at school, receiving glowing reports. He is excited about moving up to Year 3 and is taking everything completely in his stride as always. We have just returned from a fantastic family holiday which Josh thoroughly enjoyed, even learning to swim. We are so proud and feel very blessed and very lucky that after everything he has been through, Josh is able to live life to the full and we all treasure every single minute. 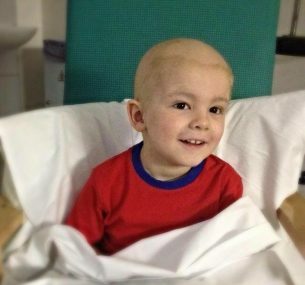 Josh was diagnosed with Burkitts Lymphoma, a very aggressive cancer, at the age of three in April 2014. At that point in time, within seconds, our life fell apart and shattered into millions of tiny pieces. No one can ever prepare you for the pain and total devastation you feel when you are told: “I’m really sorry but Josh has cancer”. I fell to the floor screaming whilst my husband stood listening to our consultant in total shock with tears rolling down his face. 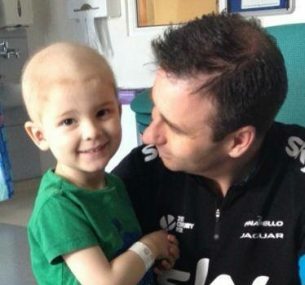 The following day our cancer journey started as we were admitted to Ward 84 at Royal Manchester Children’s hospital, for the official diagnosis, placement of his Hickman line and start of his very intensive chemotherapy. The emotions we went through are so hard to describe and we shed constant tears. Over the following days we found our strength with support from the other inspirational families and their brave children and also the incredible staff helping us through. We could never have prepared ourselves for how ill our precious little boy was to become in order to get him better. 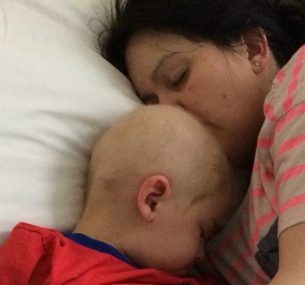 The temperatures, the hair loss, loss of control of his bladder and bowels, his skin breaking down into raw open wounds, the sickness, infections and so much more. The mucositis he suffered with was horrific, he had ulcers all over his mouth and down throughout his body. He couldn’t talk, couldn’t eat, couldn’t drink, couldn’t open his mouth, couldn’t move and he must have been in horrific pain and felt so ill. It was heartbreaking and we were helpless. He was hooked up to so many things to help him through alongside his chemotherapy, anti-sickness, high dose IV morphine, high dose IV paracetamol, IV antibiotics. 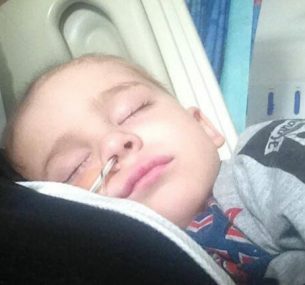 He was too poorly to have a nasogastric tube and Josh had to be “fed” through his Hickman lane via TPN (total parenteral nutrition) which was able to provide him with the nutrients his body needed whilst he fought this horrific battle. He was this poorly for what seemed like forever. Our Golden Moment was when Josh managed to eat and drink something and take some steps. After seeing our little boy so poorly, words cannot describe how incredible it was to see Josh trying something to eat and put food to his mouth. It was a nibble of a chicken nugget and it was the most amazing overwhelming feeling ever. Everyone celebrated with us, including the nurses; it meant the world to them too. We helped him out of bed and although he was incredibly weak, he stood unaided and although very wobbly with our help, he took a couple of steps. There are no words to describe how amazing it felt. Imagine seeing your child walk for this first time but the feeling was so much more powerful. After so many dark days, this was such a wonderful golden moment in our journey. 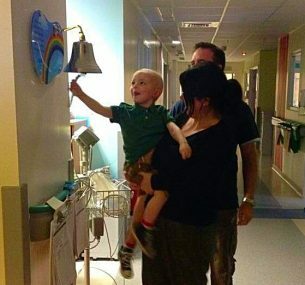 Josh ringing the end of treatment bell after four months in hospital of gruelling chemotherapy. This special bell was placed on the ward during our time there and was introduced by another oncology family on the ward. The bell gave us so much hope, we longed for the day that Josh would get to ring it and we could start the next chapter of his life. We heard the bell rang several times when we were there and it was amazing to see all the families and doctors and nurses gathered round celebrating with that child and their family, it was very emotional and very special. It became something we focused on with the hope it gave us and we were able to show Josh and tell him he would be able to ring that bell too very soon. On July 18 we had that moment, everyone gathered round; we were able to thank everyone for everything they had done for us during Josh’s time on the ward. Josh rang that bell loud and proud, everyone cheered and celebrated. It was such a special moment and at that point we walked off the ward (our home for so long) and took our superhero home ready to start his new life. A very special golden moment. 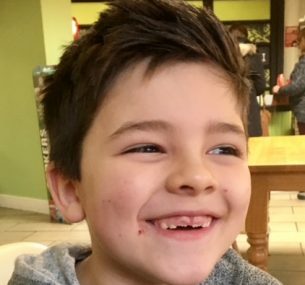 In July 2018, Josh will have been in remission for four years. He is in Year Two at school and is doing really well. We now only have check-ups at the hospital every six months which luckily Josh isn’t phased by and he enjoys going to see everyone who made him better and also his ward friends. The hospital is a second home and our safe place. I don’t think Josh fully understands the enormity of what he has been through as he is still so young and was only diagnosed at the age of three. We have a massive box of things dedicated to his journey and one day when he is old enough, we will show Josh and tell him his story. Every day we tell him how brave he is, he is our superhero and that he is capable of achieving anything in life. Josh is so loving, never stops smiling and is so full of fun and energy. He enjoys every second of every day; he inspires us and has taught us so many important lessons about life. We are so proud and are truly blessed. Have you or a family member been affected by childhood cancer? Many of our supporters have been affected by childhood cancer – either through family, friends or their own personal experience. These patient stories can help inspire others to get involved with us, or can support our media work. If you have a story that you would like to tell, please contact us by email today.